Slab leaks are a common plumbing disaster in many houses. These are water leaks that occur underneath slabs of concrete in a person’s home. These leaks can be particularly frustrating because they do take place underneath heavy concrete slabs. This may also make them hard to detect. However, early detection is extremely important in the repair of the leak. It is also important to manage the damage that’s occurred and prevent any more damage from happening. In order to help you detect a slab leak as quickly as possible, here are 5 warning signs of a slab leak in your home. One of the first methods of slab leak detection is noticing a persistently hot area of your floor. This warm area could be an indication that a hot water line underneath the slab has busted. 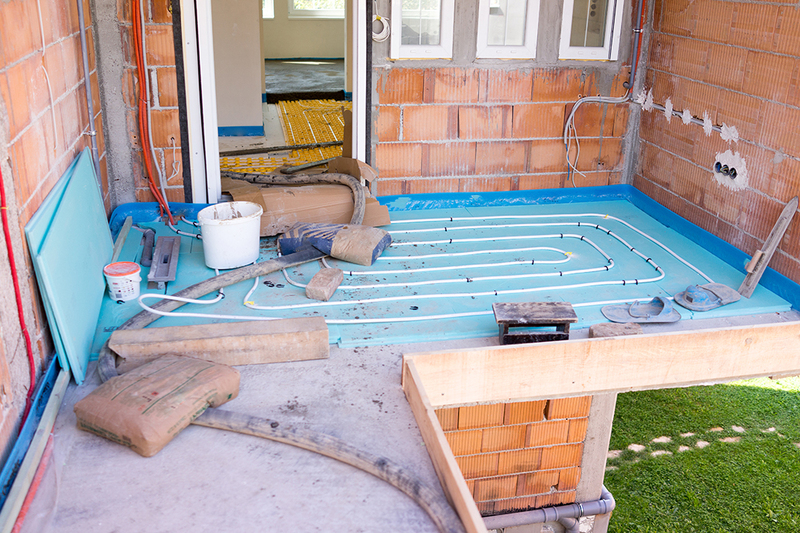 This hot area on the floor will only occur if it’s a hot water line that was damaged. Otherwise, you will have to wait for other indications of the leak. When you start to notice leaks, the situation is escalating and needs to be handled as quickly as possible. Pools of water and other leaks are an indicator that the water is not only leaking from the pipes, but it is also leaking so much that it is getting through the walls. If your floor is constantly wet, even when you didn’t take a shower, this could be due to a leak. If toilets, tubs, or showers are not working, this is a sign that the water line might be broken. Identify which appliances are backup up to help identify where the leak might be and look for other signs of a leak. If this is the only indication of a leak, try to eliminate other possible causes of the backup. Water is powerful and will attack the integrity of the foundation of your home after awhile. This can also manifest itself in cracks in the floor and walls of your home. If you see cracks and/ or movement, this could be a bright, blinking billboard for a slab leak. Slab leak repair can get rather expensive at this point, so be sure to act as quickly as possible. Water damage can result in mold and mildew. The water saturates the wood and creates a breeding ground for the mold and mildew. The mold and mildew then create an unpleasant odor. Often, you will notice the foul smell before you notice the mold itself. Be especially mindful if you notice the smell of mold in a certain area of your home. Other possible signs could be an unusually high water bill and sounds of running water. If you do notice a problem, remain calm, stop water if you can, and call a plumber. Leaks are a common problem. It’s important to remember that the longer you let the problem persist, the more extensive and expensive the damage will be. Act now and be sure to call Accurate Leak and Line right away if you think that you might have a slab leak. A slab leak is fixable, and you can take care of it with less effort than you may think.